The earth is about to be demolished by the Vogons to make way for a new hyperspatial express route. Luckily for Arthur Dent, his friend Ford Prefect turns out to be an alien from Betelgeuse and ‘a roving researcher for that wholly remarkable book The Hitchhiker’s Guide to the Galaxy’. Seconds before the planet is vaporised, Arthur and Ford escape by hitching a lift on the The earth is about to be demolished by the Vogons to make way for a new hyperspatial express route. Luckily for Arthur Dent, his friend Ford Prefect turns out to be an alien from Betelgeuse and ‘a roving researcher for that wholly remarkable book The Hitchhiker’s Guide to the Galaxy’. Seconds before the planet is vaporised, Arthur and Ford escape by hitching a lift on the flagship of Prostetnic Vogon Jeltz … Douglas Adams brilliantly combines science fiction with the finest tradition of English humour. In this, the first of his ‘trilogy of five’, he introduces Earthbound readers to Zaphod Beeblebrox, Marvin the Paranoid Android, Pan Galactic Gargle Blasters, the Babel fish and the stolen Heart of Gold starship. Ford knows how to see the Marvels of the Universe for less than thirty Altairian dollars a day, and is overjoyed to be back on the road. Arthur takes a different view. Cut adrift in a strange universe, his planet a smoking ruin, he frequently has to be reminded of the friendly advice inscribed on the cover of his new guidebook: DON’T PANIC. An international bestseller and a comedic triumph, this pan-Galactic odyssey reveals its author’s erudition on all topics relating to Life, the Universe and Everything. It has appeared in film, radio and television adaptations all over the world – and possibly beyond. This Folio Society edition is introduced by Terry Jones, a friend of Adams and fellow traveller in the universe of surreal comedy. 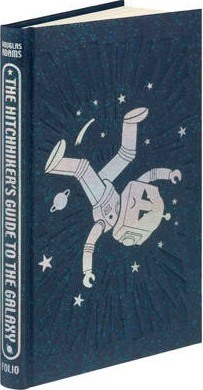 This Folio Society Edition is bound in glitter-pressed cloth, with an embossed and printed design of Marvin the Paranoid Android. Introduction by former Monty Python Terry Jones; 7 color illustrations by award-winning artist Jonathan Burton. Set in Sabon; Book size: 9" × 5¾".